Secrets Fly (1A) catches Little James Brown (#2) in the QHRAI Stallion Service Auction Futurity at Indiana Downs Saturday night. SHELBYVILLE, IN�AUGUST 24, 2013�Cynthia Allen's Secrets Fly got his second futurity win of the season Saturday night with a neck victory over Little James Brown in the $180,220 QHRAI Stallion Service Auctions at Indiana Downs. Fast Prize Man finished three�quarters back in the show position. Under jockey Juan Guerrero, Secrets Fly got his fifth career win from seven starts. He completed the 350 yards in :17.964 seconds. The $70,286 winner's purse swelled his bankroll past $127,500. Last May Secrets Fly won the Old South Futurity at Delta Downs and was also a finalist in the Harrah's Entertainment Futurity at Louisiana Downs in March. Ron Raper conditions the NO SECRETS HERE gelding from the Strawfly Special mare Once Up A Fly. Jovetta Meredith is the breeder. Little James Brown, who came into the race as the fastest qualifier, led most of the way but got caught the wire and settled for second place. Owned-and-trained by Randy Smith, the IVORY JAMES Oklahoma-bred earned $34,242 under jockey Cesar Carrillo. Karen Cloud bred the gelding from the Title Contender mare Fredas Title. Raper also saddled Fast Prize Man who earned $16,220 for owner Cynthia Allen. Oscar Delgado rode the gelding. 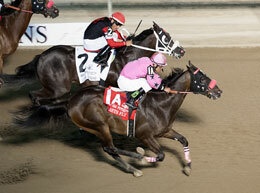 The Louisiana-bred 2-year-old has earned $45,797 this season. Dale Cartimiglia is the breeder. Completing the field were Eagles Secret, Wh Blazen Beach, Born Too B Famous, She Be A Diva, Dna Crystals Jessie and Air Dashing Courage.